HFMD, the dreaded infectious disease that’s every parent’s nightmare! Some of my friends went through numerous times of HFMD in the household. It’s strange that we never had this when we were young. Anyway, if you have young children, this is something you’d never want to get. The symptoms are high fever, followed days later by red spots, which eventually turn into blisters on the soles of the feet and palms. They may appear in various degrees of seriousness and some children may even get rashes on thighs and arms. At the same time, red spots or rashes appear around the mouth and ulcers in mouth and throat. Just think of the most terrible sore throats you’ve ever had. That’s it!! The first time it appeared in our household was in the first year of 宝贝口水妹’s nursery. Her symptoms were pretty mild, I assume. Because she was eating like nobody’s business when she had it. Maybe just a little wincing when she swallowed her food. But, it sure was infectious. She managed to spread it to the adults. YES! Adults can get it too!!! And when adults get it, it’s 10 times more painful than the child’s!! It may also be that we are more articulate (kao Peh) about it! Besides, I was pregnant at that time. It was sheer torture! We recently had a bout of HFMD. This time it happened to 小小宝贝. We didn’t even bring him to the doctor although we quarantined him at home for a week til he’s fully recovered. His symptoms were relatively mild too. Besides the fact that he had the blisters on his palms and feet, he was behaving as normally as a little boy should – wreaking havoc at home (at the despair of his grandmother who’s his caregiver). 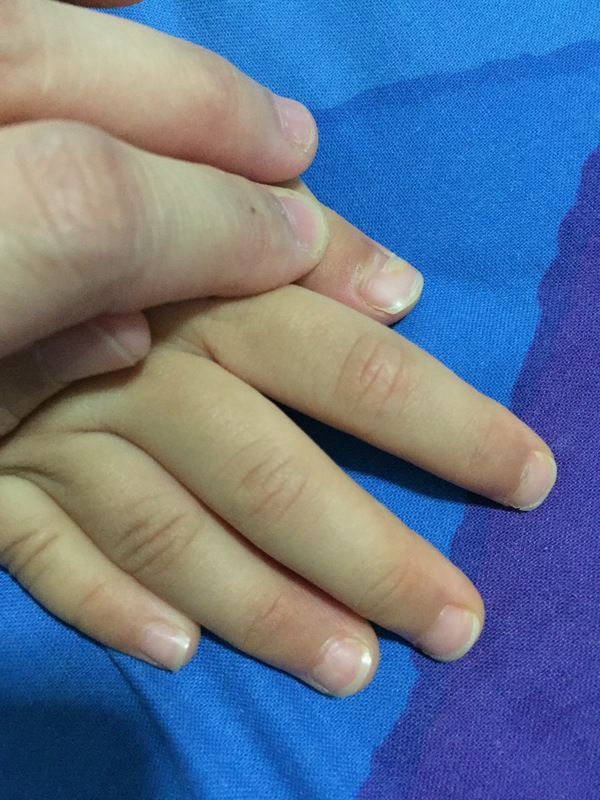 Just a week back, I read on Facebook that one of my friend’s daughter’s nails have fallen off due to HFMD. 😱 Yes, there’s a particular strain of HFMD that causes this. When it happens, it causes the nails to stop growing. When the body has cleared itself of the disease, the nails started to grow again. So the nails crack due to this. His isn’t too serious. It’s more obvious on his thumb, but if you look carefully, there’s a slight crack on every single nail. It looks really painful (I’ve had bruised nails detaching themselves from the nail beds before. Owww!). In actual fact, there’s no pain at all. I think Mommy is more anxious (gan Cheong) about it than he is.